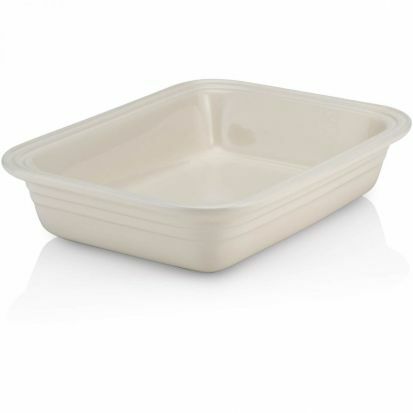 The 29cm stoneware rectangular dish is the kitchen essential stape. This Le Creuset rectangular dish, with a 1.65L capacity, is ideal for an array of home cooked delicious dishes, pasta bakes, gratins and/or sweet and savory pies. Perfect everyday cooking, with an all-round easy grip, wide rim for an easy and safe grip. Le Creuset's stoneware ensuring your food stays warmer for longer when served at the table. Le Creuset Stoneware Dishes are suitable for marinating, baking, grilling and roasting foods and can also be used in the fridge or freezer. Made from specialist clays and fired at the highest temperatures, all Le Creuset stoneware is strong and durable, with each piece covered by a 5-year guarantee. Finished with Le Creuset's signature glaze the dense stoneware provides exceptional thermal resistance and maintains an even temperature when cooking. Le Creuset enamelling expertise ensures all stoneware products are easy to clean and scratch resistant.